Wakefield Camera Club Est: 1891. Serving photography in Wakefield and District for 125 years. On the evening of Monday 26th November a packed room was treated to John Gardner’s Annual Retrospective evening. John is a highly regarded professional photographer who works both locally and nationally. He is a keen and very knowledgeable naturalist and has been a member of Wakefield Camera Club for many years. Each year he gives a visual retrospective over his photographic year – both work and pleasure. They are always eagerly anticipated and tonight was no exception. 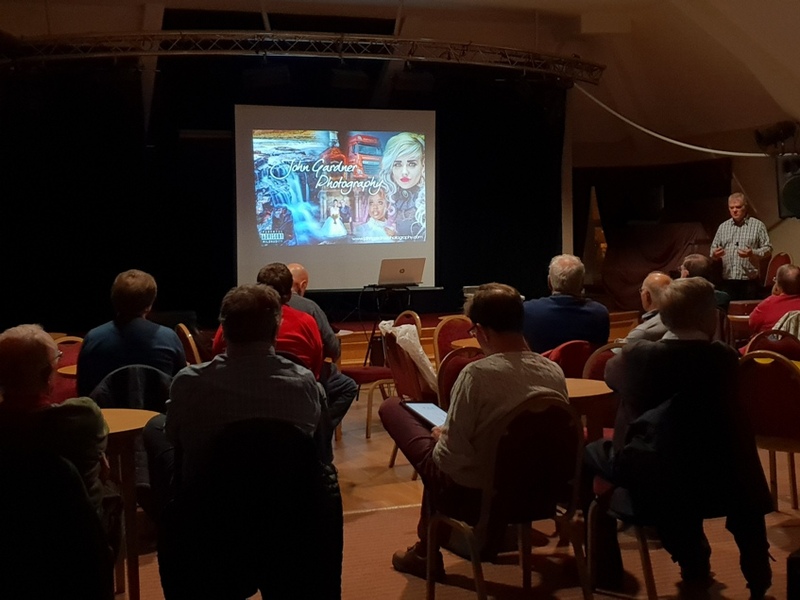 In a change to previous years, John chose to go straight into his slideshow and commentary, leaving his A/V presentation to the end. With his professional hat on John mostly shoots people and commercial work but his first love is nature photography. So it was that he started the evening with a marvellous collection of images of mainly birds and insects. He started with images taken whilst England was suffering the Beast from the East which made the birds less shy as they had to find food. After the birds came a short section on infra-red photography with taken with a Fuji XPro camera which John had converted after buying the Fuji XT1. It was followed by a section on moths, all beautifully shot. John’s enthusiasm for the subject came shining through and the displayed images showed why one could become captivated by them. Then John moved on to his commercial work for the Air Ambulance, Redrow Homes, a dental clinic and book covers amongst others. When doing this type of work he always uses flash, even when there appears to be plenty of daylight because then he can control the light with highlights and shadows where he wants them. To round off the first half John gave us a taste of the model work he would concentrate on in the second half. The second part of the evening centred on his work with various models, both in the studio and on location. There was a wide range of styles but all shot through with a quality which is difficult to obtain. John said that he was going through a “vintage” phase as illustrated by a series of shots taken in an American-style diner with a very 50’s feel. As usual he was at pains to explain why he chose the pose and the lighting to gain the effect he wanted. All of it was very practical and gave an insight into the production of striking images as well as being very amusing at times. He rounded off the evening with an A/V consisting of images of just one model showing the different styles he employed. As usual, although John probably overran his time, it finished far too soon for everyone watching. It is always amazing that these annual retrospectives always appear fresh and impressive ….. but they do. Thanks again John for another great evening. ‹ Michelle hits the headlines again! See our calendar for the year's events. The evening was black …. and white. © All rights reserved. All content and images on this website are copyright of Wakefield Camera Club and/or the individual author. Content may not be copied, reproduced or published in any format without the express permission of the Club and/or the individual author.